There could be a new sheriff in town – in an Illinois county, to be specific. 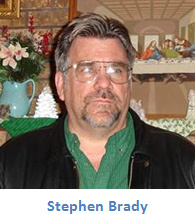 Former Catholic activist and current child advocate Stephen Brady has announced that he will be pursuing the Republican nomination for the office of Menard County Sheriff in the upcoming 2014 March general primary. Brady, who was born in Decatur, Ill., attended Purdue and Indiana universities for a short time before being drafted into the Army, where he was trained as a military police officer. While in the Army, he received a "secret security" clearance from the FBI. He was then sent to northwestern Illinois on special assignment for just over a year. After moving to Petersburg, Brady married Jo Ann Lyons. He and his wife have seven children and ten grandchildren. His family has owned a construction company, a flower shop and, at present, a pizza restaurant. Brady spent 13 years as lead investigator for the not-for-profit organization Roman Catholic Faithful, which investigated child exploitation and other abuses of authority. After receiving death threats and being interviewed by investigators regarding the March 1998 still-unsolved murder of Father Alfred Kunz, a priest of the Diocese of Madison, Wis., who had been assisting Brady with his investigations into clergy corruption, Brady has kept much of his work life private in order to protect his family. He has given lectures across the U.S. regarding his investigations and has helped with certain cases outside the U.S., including South Africa, Australia and England. On a national and international scale, Brady was instrumental in exposing a clandestine website and network of actively gay and dissenting priests known as St. Sebastian's Angels – and, believe me, they were no angels. Click here to read about the scandal. In addition to the persecution he and his family suffered as the result of his work with RCF, Brady has endured two personal tragedies: the death of one of his sons in an automobile accident and being severely injured himself in a motorcycle accident. Despite all this, he's moving forward. "My wife and I have run three successful businesses," says Brady. "I ran a small international corporation as its president and CEO. I believe that this experience, combined with my law enforcement training with its significant responsibilities, has taught me how to treat people in order to earn their respect as well as how to efficiently run the sheriff's office." He looks forward to serving the citizens of Menard County if given the opportunity.